Full opening of electricity market in Singapore to fire up competition: What will retailers do? Electricity retailers will likely try to outdo each other based on price and other promotions but in the long run, differentiation by service and innovation will be key, experts say. Singapore-based IIX Growth Fund has anchored a $1.66-million Series A round in SOLshare, a Bangladeshi off-grid solar energy firm that seeks to increase clean energy for over 19,000 households in the country. Anwar Ibrahim promised to develop Port Dickson, alluding to investment from Singapore, in the first full day of campaigning for the seaside parliamentary seat today. Leaders of the “Ready4Repeal” petition are urging gay and straight people alike to speak up and encourage MPs to support their cause. Singapore-based fragrance and cosmetics distributor Luxasia has taken a majority stake in Pacific SMM to expand its reach in the Australia and New Zealand, according to an announcement. Capital Fund Management S.A. acquired a new stake in iShares MSCI Singapore ETF (NYSEARCA:EWS) during the second quarter, according to its most recent filing with the Securities and Exchange Commission (SEC). A Singapore news outlet has called out an Umno leader for allegedly spreading fake news about PKR president-elect Datuk Seri Anwar Ibrahim. A Singaporean on a paragliding trip to Indonesia found himself caught in the middle of the devastating quake-tsunami that hit the island of Sulawesi on Friday (Sep 28). Singapore leaders have written to Indonesia`s President Joko Widodo to offer their condolences over the recent earthquakes and tsunami that struck Palu, central Sulawesi. Voluntary welfare organisation I Love Children (ILC) on Sunday (Sept 30) announced plans to conduct a study on Singapore’s low total fertility rate. A 26-year-old man was arrested on Saturday (Sept 29) for allegedly harassing members of the Church of Our Lady of Lourdes in Ophir Road. Seven of the fourteen residents of the Singapore Boys’ Home, who were arrested on Friday evening, have been charged with rioting according to Minister for Social and Family Development Desmond Lee. Singapore’s Foreign Minister Vivian Balakrishnan stressed that creating a world with rules-based order is to preventing small states from ceasing to exist. A man has been arrested on suspicion of being involved in the online sale of counterfeit luxury watches and accessories, the police said in a press release on Saturday (29 September). DeClout Ventures, the indirect joint venture firm of SGX Catalist-listed DeClout Limited, has made its maiden investment of S$500,000 ($366,000) in Singapore-based video analytics specialist Vi Dimensions. We talk about dog years. But what a difference five years makes in aviation terms. They had practised at least 60 different accident scenarios, but nothing could have prepared the team for what greeted them when the curtains were drawn back. Singapore’s largest telco, Singapore Telecommunications Limited (SGX: Z74), published its latest annual report – for the fiscal year ended 31 March 2018 – in late June. With a one year waiting list, Cherin Sim has taken artwork into a new form and function through the customisation of leather goods. Ho Kwon Ping has an almost sage-like quality about him and while his pronouncements on businesspeople’s role in solving problems such as income inequality often make the headlines and seem to resonate with the public, I wonder how far he actually walks the talk. There’s more to this CBD landmark than its seedy reputation, gaudy discos and Thai restaurants – where a community of Singaporeans and Thai nationals thrive, and Instagrammers trespass to capture that perfect selfie. They come from different backgrounds and generations – the youngest is 26 years old and the oldest, 93. But they all share the same generous nature when it comes to lending a helping hand to the people around them. The Republic’s first turtle hatchery opened at the Sisters’ Islands Marine Park yesterday, allowing conservationists to better protect rare sea turtles which have been increasingly sighted here. Singapore sees the most rapidly ageing population in Asia alongside South Korea and Taiwan. This chart from Allianz Global Wealth Report shows that old age dependency ratio is expected to be rise even further in the next decades. Co-working operators remain as the most active space seekers in the area. The office leasing market sustained its growth for the sixth consecutive quarter in Q3 2018, a study by JLL revealed. Specifically, average rates of Grade A office rents in the Central Business District (CBD) rose 2.3% QoQ to $9.93 psf pm. There is strong demand for lighting specialists, said Temasek Polytechnic (TP), with more than 7,000 local job postings for designers with lighting design skills in the past three years. He is petrified of cockroaches, but Marcus Ong, 27, managed to keep his fear in check and started a pest control firm, PestGoCleaning, last year. On September 19, Wallem’s Chairman, Board of Directors and Senior Management team were joined by clients, partners, colleagues and friends to mark Wallem Singapore’s 60th anniversary. 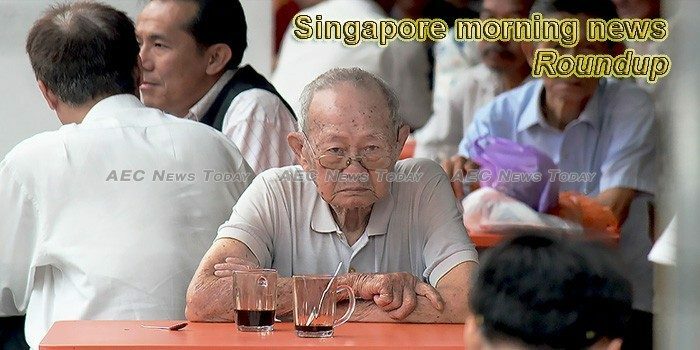 This week’s Singapore morning news feature photo acknowledges International Day of Older Persons, October 1.